Salads and satisfying usually don’t go in the same sentence. 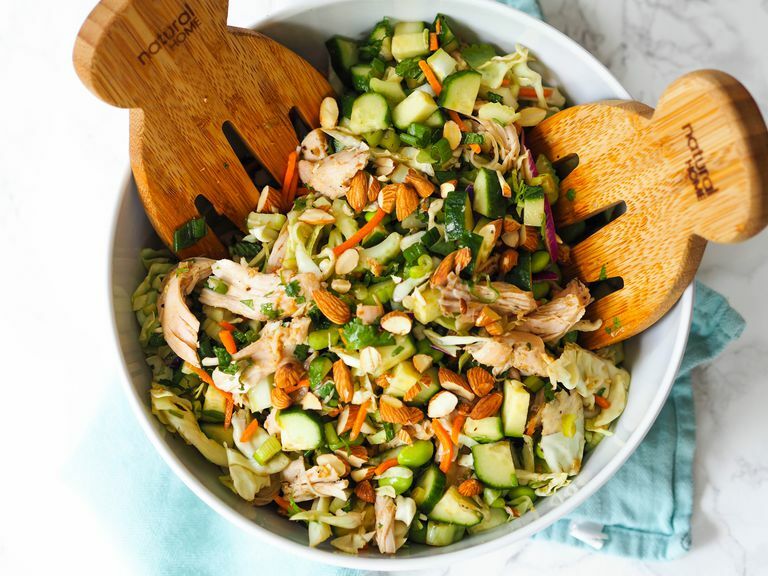 But this Asian chopped salad is packed with protein from grilled garlic-ginger chicken, edamame, and tons of crunchy, raw vegetables. There’s no shortage of flavor from bright, fresh herbs and a tangy soy-lime dressing. In a small bowl, mix together sesame oil, garlic, ginger, and salt. Rub all over chicken breasts and place in a zip-top bag in the refrigerator to marinate for 8 hours. When ready to cook, oil the grates of a grill and set on medium-high heat. When hot, place chicken on the grill and cook 5 to 7 minutes per side until grill-marked and chicken registers 160F in its thickest part. Remove from grill and set aside to cool. While chicken is grilling, toss lettuce, cabbage, carrot, edamame, cucumber, celery, scallions, mint, and cilantro together in a large bowl. When chicken has cooled slightly, shred into bite sized pieces with a fork. Add to the bowl with the vegetables. In a medium bowl, whisk together soy sauce, sesame oil, honey, and lime juice. Add to salad and toss to combine. Serve immediately. Don’t eat meat? This salad can easily be made meatless by swapping chicken for tofu. Press the tofu dry, cut into bite-sized cubes, and toss with the ginger-garlic paste. You may want to add another tablespoon of sesame oil to help thin it down and coat the tofu. Skewer the tofu before grilling a couple minutes per side so it doesn’t fall through the grates. Although this salad is plenty filling, if you’d like to bulk it up a bit more with a complex carbohydrate, toss in a scoop of cooked brown rice or quinoa, both of which are packed with fiber and add to the protein count. You could also make it a noodle salad, mixing it with cooked and cooled brown rice noodles. Find them in the Asian aisle of most grocery stores. What I love most about salads made with cabbage is that it doesn’t wilt, so you can make your salad ahead of time as an easy, grab-and-go lunch. The same can’t be said for lettuce, so I would pack it in a separate bag and toss it together before eating. You may need to brighten the dressing a bit, so pack an extra lime wedge to squeeze over your salad before eating. Forgot to marinate your chicken? Don’t worry—I always do that too! It’ll still have plenty of flavor if you give it a quick 15 minute bath in garlic and ginger. Stuck with leftover herbs after making this recipe? Blend the mint and cilantro together with olive oil and a bit of lime juice in a food processor for a tangy pesto to serve with fresh or roasted veggies. If you know you won’t use up your ginger, peel it and store it in the freezer, where you can grate it from frozen using a microplane grater. To save time, look for pre-chopped or shredded cabbage, lettuce, and carrots.